Fake Fire - No more, burning down houses! Last edited by Semmett9 on Fri Apr 11, 2014 13:31, edited 1 time in total. You might like to try some of my Mods and Texture packs. I've already played with it on the Kingarthur server. Fake fire is a good way to have fire where it is needed without the disadvantages that come with the "real" fire - no damage through griefers, no nodes destroyed. It's a fun mod. Looks Good! Great way of making fireplaces. Very nice. Thanks for the feedback. 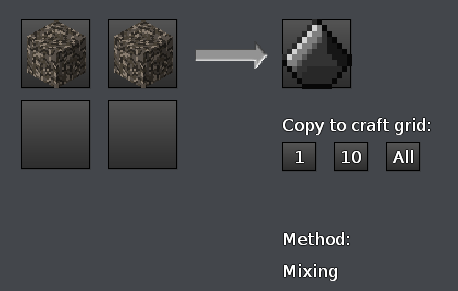 They was a problem with the flint and steel image in the 1.3 version of the mod ! however it is now fixed! if you have a problem please download the mod again. Last edited by Semmett9 on Tue Jun 11, 2013 19:30, edited 1 time in total. Last edited by Semmett9 on Thu Jul 18, 2013 09:35, edited 1 time in total. But both links here, and on your website lead to add-fly. I dont know why people use ad-fly, Im sure there must be a reason, but I cant download from ad-fly pages. ad-fly plays havoc with my browser. Shouldnt the direct download link lead to a direct download? Last edited by Misty on Mon Oct 07, 2013 14:51, edited 1 time in total. Certified 100% signature Virus free. In minecraft, people use adf.ly for every link that they post. Adf.ly is frowned upon here, just like .rar archives. I agree, don't use adf.ly links. I have adblock though, so they don't bother me, but for the sake of people who don't, don't use adfly links. People use adfly to earn money. Yes, I know, but don't do it here. 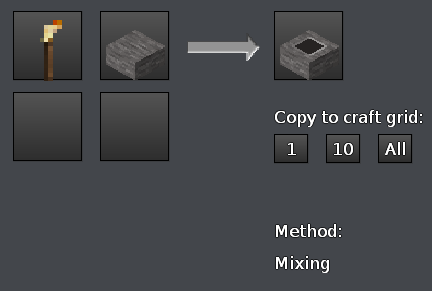 ...If you use flint and steel to set fire to a block, can only you remove the fire, or can anyone? Re: Fake Fire - No more, burning down houses! 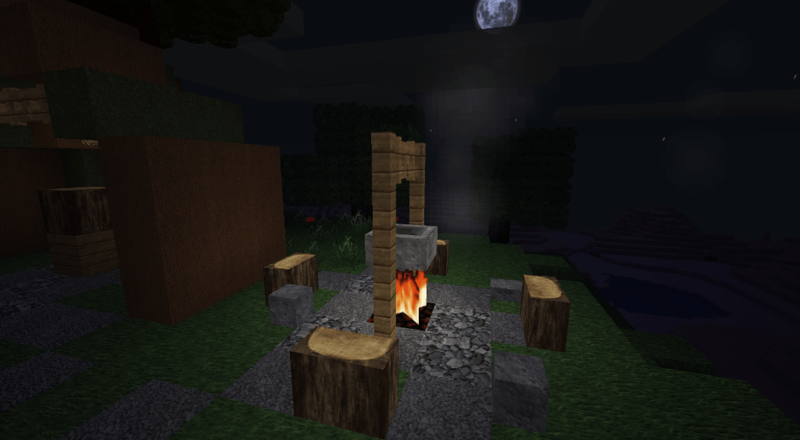 LazyJ's Fork of Semmett9's, Minetest Mod, "Fake Fire"
could make warm hearths and campfires without fear of burning down our builds. neighbors about the fires spreading and destroying their stuff. 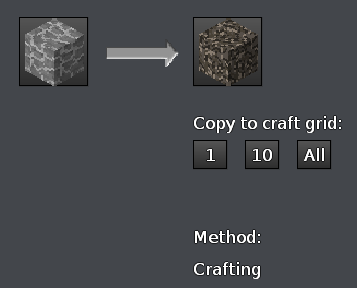 As a creative bunch of Minetesters, we often come up with new ideas for things. This fork of "Fake Fire" incorporates some of those ideas. Originally, "Fake Fire" only had one flame type and *no* smoke. 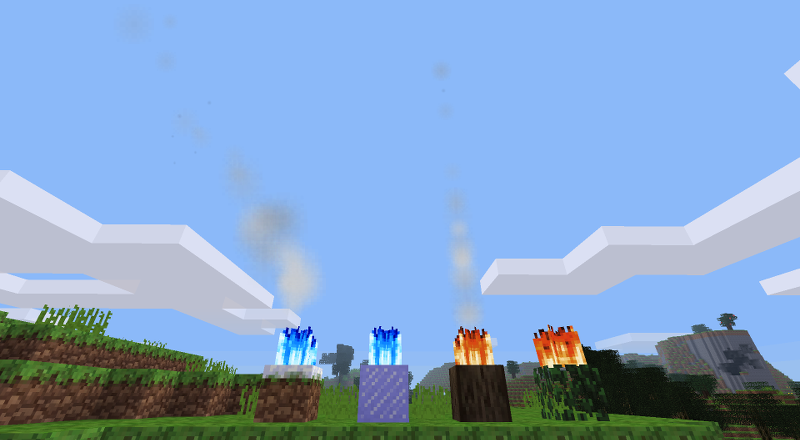 I added rising, dissipating, animated smoke. Then, a few months later, I added the ability to punch the smoke feature on and off in addition to a new flame type - Ice Fire! Ice Fire's blue flames only appear when the fint-and-steel tool is used on snow and ice stuff. The smoke column will rise about 14 spaces above the flame with intermittent puffs of smoke. I've updated the smoke to use particles instead of an animated node. The effect is much more realistic. 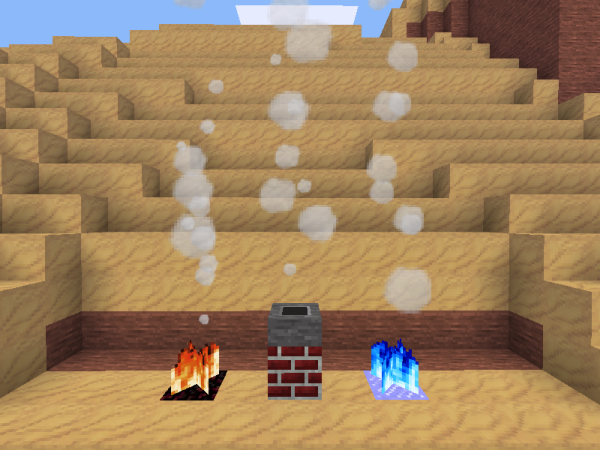 Particles allow the smoke to drift away, as seen on the left. Perfect for outdoor campfires and cook-outs. The vertical column, as seen on the right, is better suited for use *inside* chimneys. 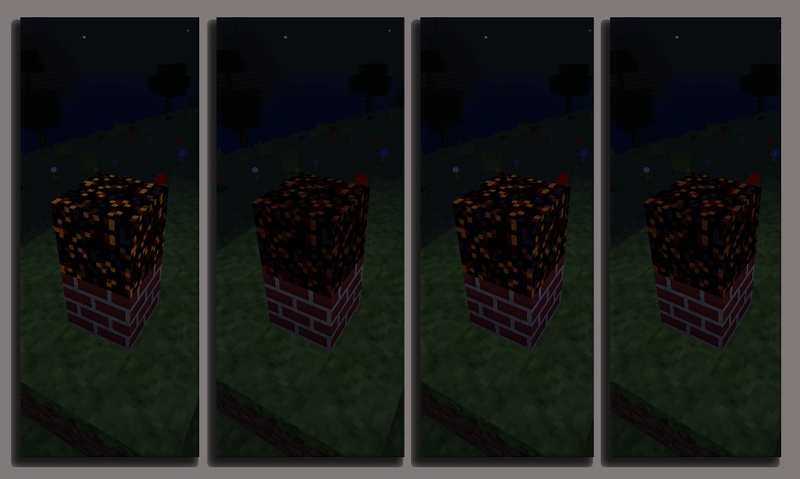 Chimney Tops are special blocks that emit smoke without a fire. Like the smoke from the various flame types, it can be punched on or off. 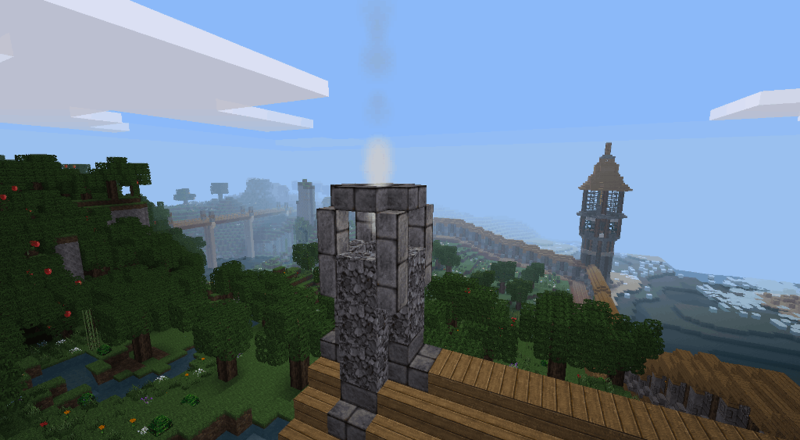 The chimney tops currently come in two color choices, sandstone for warm-toned builds and stone for cool-toned builds. 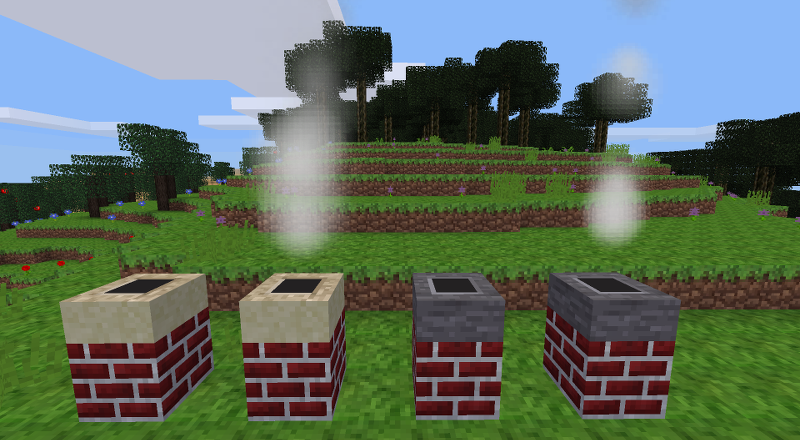 The new particle smoke has been added to the chimney tops too. 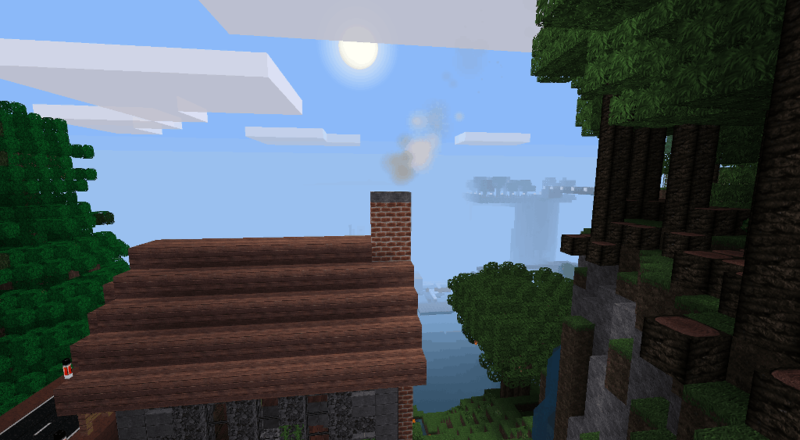 The drifting smoke looks much more realistic when coming out the top of a chimney. The vertical column smoke may look better if surrounded by a lot of wind-breaks. The grey, stone chimney_top can be used to simulate a boiling pot over an open flame. Chimney_tops can also be placed inside extra tall, large chimneys to extend the smoke as may be the case with very large builds. One of the prevailing challenges of building in Minetest is overcoming its thick, oversized, mismatched proportions. Chimneys are just one example. 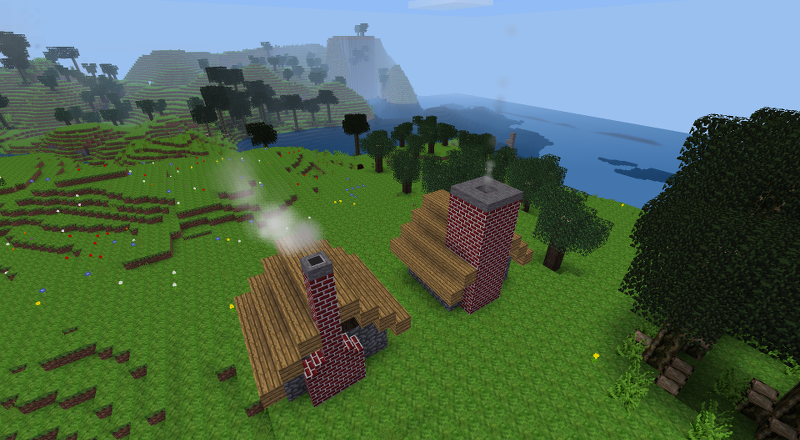 The new block-type, "Chimney Tops", solves the problem for chimneys by allowing players to make 1x1 chimneys that are proportionate to the build. Otherwise they would have to build chimneys that are at least 3x3 to allow the smoke to rise or not have rising smoke at all. 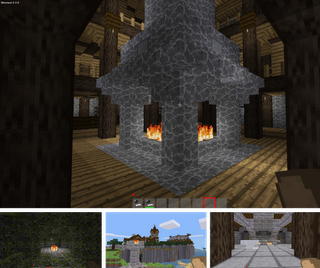 The build on the right visually demonstrates the problem while the build on the left displays the solution. 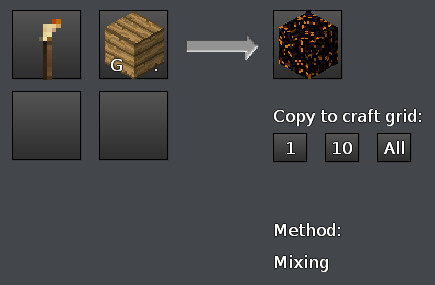 Another new block-type I added is the "Embers" block. 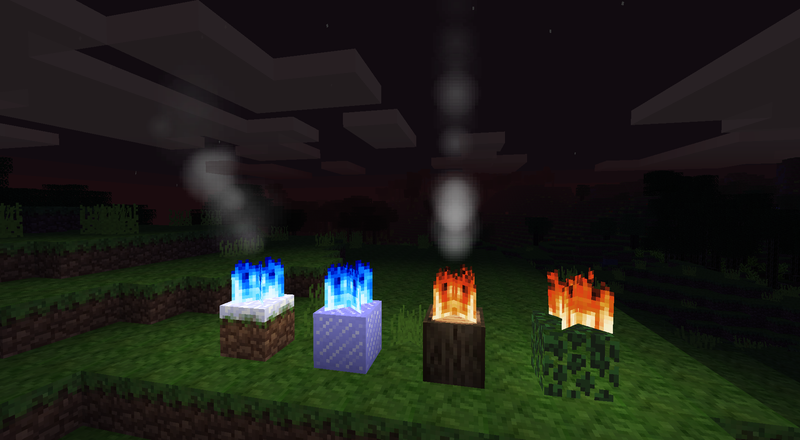 Embers blocks are animated with glowing embers and emit a mid-level light. Perfect for placing under a flame or without a flame as in the case of open-pit or BBQ cooking. 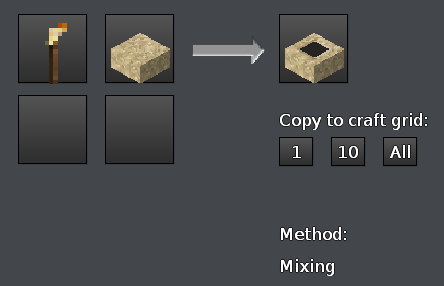 I've tested on both, particularly later releases of 0.4.10. This fork does not use deprecated code that will cause later releases of 0.4.10 to crash due to the code no longer being supported. Strike that. I forgot I have my mod testing version of Minetest configured to abort on usage of deprecated calls. Rename the directory "fake_fire_fork-master" to "fake_fire"
I've considered the new "firelike" drawtype and yet, I still prefer the waving ability of the "plantlike" drawtype. The "firelike" drawtype, in my opinion, looks too full, too much like a raging, destructive, out-of-control blaze. Plantlike's waving and less intense flames seem better suited to a warm hearth, comfortable campfire and overall fits the non-destructive intent of "Fake Fire". Update: 2014_08_10 - See changelog below. Flames - "sunlight_propagates = true,"
Adding sunlight_propagtes and leaving comments as a future reference. If true, sunlight will go infinitely through this (no shadow is cast). Embers - "sunlight_propagates = true,"
embers *don't* have a shadow. Bug Fix - Server Crash when Flint-Steel Clicked on Nothing (sky). at, Minetest's target range ended and Minetest saw "nothing"
up it's hands in frustration and said "I quit!" by crashing. fork? Because it's a reference to compare to and learn from. 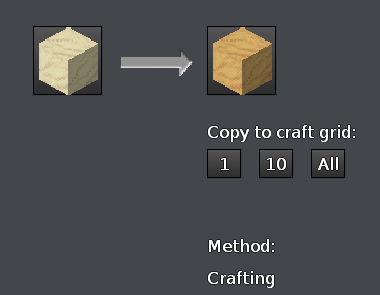 -- "texture_source_info.txt" added listing who made what textures. -- White, grey, and black smoke added. -- Smoke changed from an animated node to particles. -- Alias added to remove previous animated-node smoke. in the way, then the narrow, vertical column of smoke will be used. drifting smoke flames and chimney_tops. -- ABMs to generate the three stages of smoke. in the first two stages of smoke. and v0.4.10 (2014_07_29 release), compiled myself in Linux. configured to abort on usage of deprecated calls. with the new smoke each time it puffs into being. Last edited by LazyJ on Thu Oct 02, 2014 01:55, edited 3 times in total. Now I purpose you a smoke column based on particles. This is a lighter, prettier, highly-configurable smoke (take a look in the abms.lua file). EDIT : use the LazyJ's new fork above for download. Last edited by jp on Mon Aug 11, 2014 08:58, edited 5 times in total. Thanks a lot jp. I enjoy this smoke better. 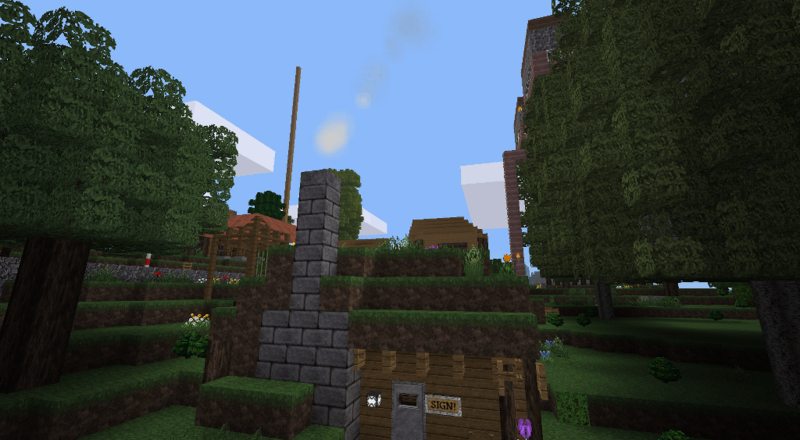 Update : VanessaE has put smoother textures for the smoke in the Homedecor modpack. 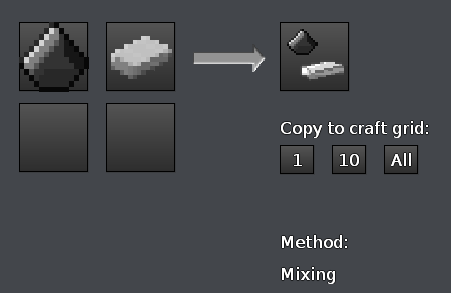 Also, I modified the settings for the particles. -> See my post above for download & screenshot. 2 columns of smoke, one vertical for the inside if chimneys, one drifting with the clouds for outside use. Space checks added for each smoke column. Does not use deprecated code that causes later releases of Minetest v.0.4.10 to crash because the code is no longer supported. Strike that. 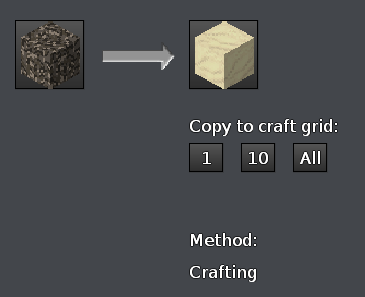 I forgot I have my mod testing version of Minetest configured to abort on usage of deprecated calls. Campfire flame with grey, stone chimney_top representing a boiling cooking pot. Last edited by LazyJ on Thu Oct 02, 2014 01:51, edited 4 times in total. looks good. 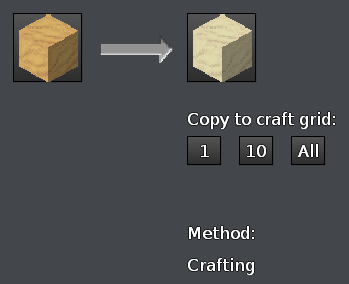 for some reason i cannot edit the post for this mod. so i desided to make a new topic on the matter. thank you for the support of this mod.